The Pure Wings 2 family fans are unique in their class, combining outstanding reliability, silent cooling, and a great price-for-performance ratio. They are the ultimate reason to put well-known be quiet! The Pure Wings 2 80mm PWM model combines all of the above essential features. With PWM your system can ramp up the cooling when it’s needed, or operate in maximum quiet mode when it’s not. The Pure Wings 2 family fans are unique in their class, combining outstanding reliability, silent cooling, and a great price-for-performance ratio. Model: BL044. Manufacturer's SKU BL044. In The Box Pure Wings 2 (BL044) 80mm 3-Pin Case Fan • 4 x Fan Screws. The Pure Wings 2 family fans are unique in their class, combining outstanding reliability, silent cooling, and a great price-for-performance ratio. They are the ultimate reason to put well-known be quiet! silent cooling in your PC if you havent already done so.The Pure Wings 2 80mm PWM model combines all of the above essential features. Pure Wings 2 80 mm Case Fan Black. SILENT WINGS 2 PWM 80mm. The SilentWings 2 fan family provides the greatest airflow-to-noise ratio and highest reliability on the market. Connector(s) 4p. Other features. Certification CE, WEEE, RU, TÃ¼v. Pure Wings 2 Silent Computer Case Fan BL044. The Pure Wings 2 80mm model combines all of the above essential features. The Pure Wings 2 family fans are unique in their class, combining outstanding reliability, silent cooling, and a great price-for-performance ratio. Shadow Wings quiet fan, low speed 1400rpm, noise @ 100% 8.4 dB(A). 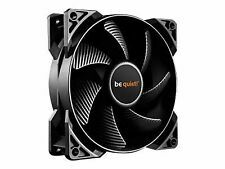 System / Case Fan 40mm - 120mm be quiet! BL050 Shadow Wings 80mm Low Speed Quiet Fan. Low-noise operation due to high-quality rifle bearing. BL037 Pure Wings 2 Pwm Case Fan 8Cm Rifle Bearing. The Pure Wings 2 80mm PWM model combines all of the above essential features. With PWM your system can ramp up the cooling when it’s needed, or operate in maximum quiet mode when it’s not. Pure Wings 2 – Outstanding Reliability and Silent Cooling The Pure Wings 2 80mm fans bring famous be quiet! They are the ultimate reason to put well-known be quiet! silent cooling in your PC. 1 x 80mm Pure Wings 2 Case Fan. 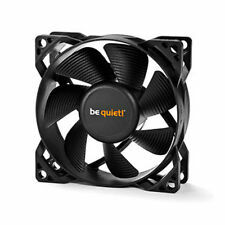 The Pure Wings 2 80mm fans bring famous be quiet! The most important features include Combining outstanding reliability, quiet operation, and a great price-for-performance ratio, Pure Wings 2 80mm is unique in its class. Shadow Wings quiet fan, mid speed 2000rpm, noise @ 100% 15.8 dB(A). 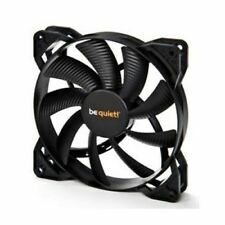 System / Case Fan 40mm - 120mm be quiet! Shadow Wings 80mm Mid Speed BL051. Low-noise operation due to high-quality rifle bearing. Product code: BL044. Pure Wings 2 8cm 1900 RPM 26.3 cfm Black Case Fan. Maximum airflow 26.3 cfm. Rotational speed (max) 1900 RPM. Logitech MK120 USB Wired Keybord & Mouse Kit (920-002552). Sound Cards. The SilentWings 2 fan family provides the greatest airflow-to-noise ratio and highest reliability on the market. Key to these fans' unrivalled and uncompromising performance are a unique airflow-optimized fan blade design, custom anti-vibration mounts, and a high-tech fluid dynamic bearing with copper core that greatly reduces noise and imparts super-long life. Variable, Virtually Inaudible, State Of The Art Cooling The SilentWings 2 fan family provides the greatest airflow-to-noise ratio and highest reliability on the market. Key to these fans' unrivalled and uncompromising performance are a unique airflow-optimized fan blade design, custom anti-vibration mounts, and a high-tech fluid dynamic bearing with copper core that greatly reduces noise and imparts super-long life. SILENT WINGS 2 PWM 80mm - 2000RPM, 26CFM, 2.25mm H2O, 15.5dB. The SilentWings 2 fan family provides the greatest airflow-to-noise ratio and highest reliability on the market. Key to these fans’ unrivalled and uncompromising performance are a unique airflow-optimized fan blade design, custom anti-vibration mounts, and a high-tech fluid dynamic bearing with copper core that greatly reduces noise and imparts super-long life. Pure Wings 2 Computer case Cooler - BL037. 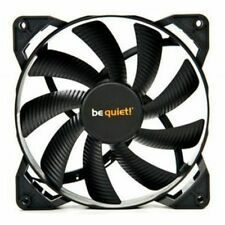 The Pure Wings 2 80mm PWM fans bring famous be quiet! The most important features include Pure Wings 2 | 80mm PWM. Combining outstanding reliability, quiet operation, and a great price-for-performance ratio, Pure Wings 2 80mm PWM is unique in its class. PURE WINGS 2, 80mm Computer case Fan - BL044. 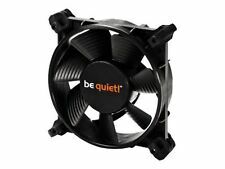 The Pure Wings 2 80mm fans bring famous be quiet! The most important features include PURE WINGS 2, 80mm, 1900rpm, 26.3cfm, 1.85mm H2O, 18.2dBa. "Pure Wings 2 – Outstanding Reliability and Silent Cooling. Model: BL028. Manufacturer's SKU BL028. The SilentWings 2 fan family provides the greatest airflow-to-noise ratio and highest reliability on the market. Key to these fans' unrivalled and uncompromising performance are a unique airflow-optimized fan blade design, custom anti-vibration mounts, and a high-tech fluid dynamic bearing with copper core that greatly reduces noise and imparts super-long life. Cooler CPU Pure Wing 2 80mm BL044. Model Pure Wings 2 80mm łączy w sobie wszystkie najważniejsze cechy produktu. Zapewnia maksymalny przepływ powietrza i pracuje cicho, na poziomie 18.2dB(A). Wentylatory Pure Wings 2 łącząc wyjątkową niezawodność, cichą pracę oraz idealną proporcję ceny do jakości, wyróżniają się w swojej klasie. Outstanding Reliability And Silent CoolingThe Pure Wings 2 family fans are unique in their class, combining outstanding reliability, silent cooling, and a great price-for-performance ratio. They are the ultimate reason to put well-known be quiet! Pure Wings 2 – Outstanding Reliability and Silent Cooling The Pure Wings 2 80mm fans bring famous be quiet! They are the ultimate reason to put well-known be quiet! silent cooling in your PC. Very quiet operation even at maximum speed, with noise of 18.2dB(A). Low-noise operation due to high-quality rifle bearing. High air flow. Simple assembly. Be Quiet. Pure Wings 280mm Case Fan Black . Be Quiet BL028 80mm Silent Wings Fans . 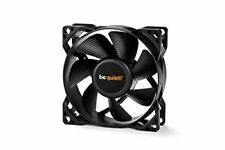 Pure Wings 2 – Outstanding Reliability and Silent Cooling The Pure Wings 2 80mm fans ng famous be quiet! They are the ultimate reason to put well-known be quiet! silent cooling in your PC. Baby Products. Wentylator BE QUIET! BL028 (80 mm; 2000 obr/min)BL028 / CHLBEQWEN0036. Low-noise operation due to high-quality rifle bearing. High air flow. mounting kit. user guide. Outstanding Reliability And Silent Cooling The Pure Wings 2 family fans are unique in their class, combining outstanding reliability, silent cooling, and a great price-for-performance ratio. They are the ultimate reason to put well-known be quiet! Product code: BL037. Pure Wings 2 8cm 1900 RPM 26.3 cfm Black Case Fan. Maximum airflow 26.3 cfm. Rotational speed (max) 1900 RPM. Logitech MK120 USB Wired Keybord & Mouse Kit (920-002552). Sound Cards. Pure Wings 2 Outstanding Reliability and Silent Cooling.The Pure Wings 2 80mm fans bring famous be quiet! - Even at maximum speed, operates at only 18.2 dB(A). They are the ultimate reason to put well-known be quiet! be quiet! 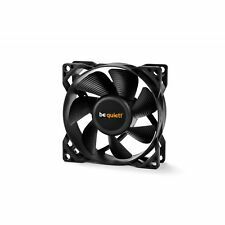 BL044 Pure Wings 2 80 mm 3-Pin Case Fan Cooling Device - Black . Pure Wings 2 – Outstanding Reliability and Silent Cooling The Pure Wings 2 80mm fans bring famous be quiet! They are the ultimate reason to put well-known be quiet! silent cooling in your PC. Product is genuine original from manufacturer authorized distributors. 4.5 out of 5 stars - be quiet! BL044 Pure Wings 2 80 mm 3-Pin Case Fan Cooling Device - Black . 2 product ratings2 product ratings - be quiet! BL044 Pure Wings 2 80 mm 3-Pin Case Fan Cooling Device - Black .